This week, I am coming back from an Erasmus+ alumni stakeholder meeting in Brussels centered on the development of the next EU Global Strategy on Foreign and Security Policy. Invited participants from the Erasmus+ community were invited to take part in the ongoing broad outreach and consultation process, which has included approximately 50 area experts, policy scholars, and stakeholder groups to date. The Erasmus+ Alumni community with the High Representative/Vice-President. The Erasmus+ EU Global Strategy meeting featured 30 Erasmus+ program members from across the world and from a variety of professional fields. 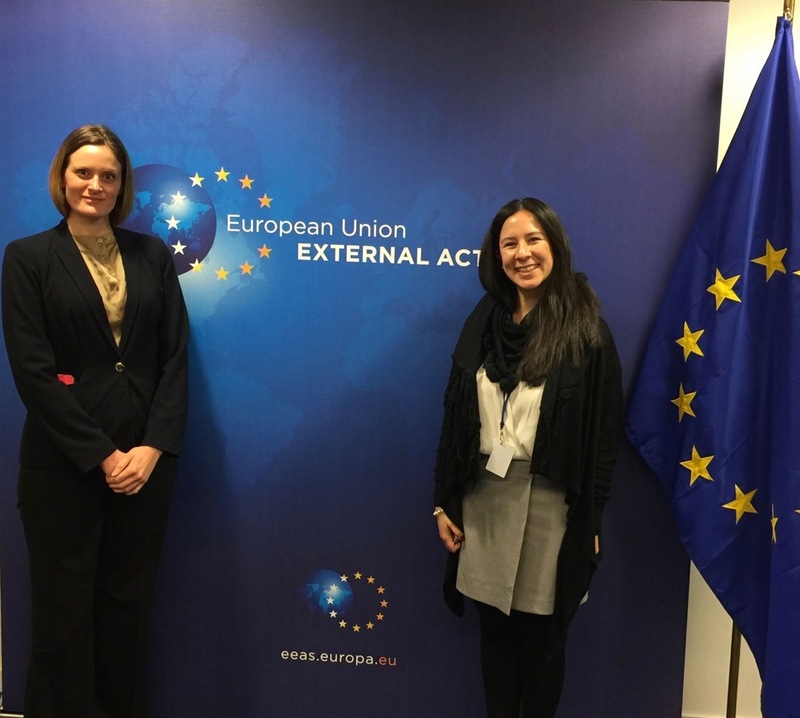 Alumni were invited to Brussels to discuss the development and priorities for the forthcoming EU Global Strategy for Foreign and Security Policy, which was last drafted in 2003. Erasmus+ community members include Erasmus, Erasmus Mundus, and OCEANS mobility courses, and I was representing the Erasmus Mundus alumni group, having completed an Erasmus Mundus joint master's degree in Lifelong Learning Policy & Management from the Institute of Education (London) and University of Deusto several years ago. Asking a question to Federica Mogherini, High Representative of the European Union for Foreign Affairs and Security Policy & Vice-President of the European Commission..
For me, one of the highlights was the opportunity to ask the High Representative of the European Union for Foreign Affairs and Security Policy/Vice-President of the European Commission, Federica Mogherini about her thoughts on the forthcoming EU strategy for working with the United States. The High Representative responded with a blend of seriousness and humor, with comments on how the Strategy's development must consider a ten-year approach to relationships with all countries and regions. In countries like the U.S. where there will be an anticipated change (or two) in leadership over this time frame, the strategy has to be directed towards the overarching best interests of foreign and security policy, regardless of political shifts that might potentially facilitate or challenge the directive. In other responses, she emphasized the potential impact the EU would have on expansion, particularly looking towards the Western Balkans. Me (left) and fellow Co-Founder of the International Network of Innovators in Education (INIE), Marcela Chavez Ocampo. Additional information and video clips are available on the European Union External Action Services website.